Activate a license to use the software on your computer. Ensure that you have the product key. 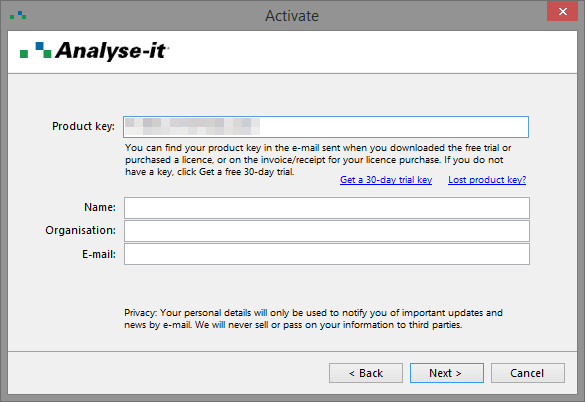 If you have lost your product key, you can retrieve it at http://analyse-it.com/support/lost-key. Ensure that TCP port 443 (HTTPS) on the firewall is open for communication to secure.analyse-it.com on your computer. Analyse-it uses your internet connection to simplify activation. On the Analyse-it ribbon tab, click Analyse-it, and then click Activate. The Activate window shows the license details. Enter the Product Key and the Name, Organisation, and E-mail of the registered user of the software. The registered user may occasionally receive an e-mail with important information about updates to Analyse-it. They can opt-out via the unsubscribe link in the e-mail they receive. The software uses your internet connection to verify the product key and activates the license on your computer. 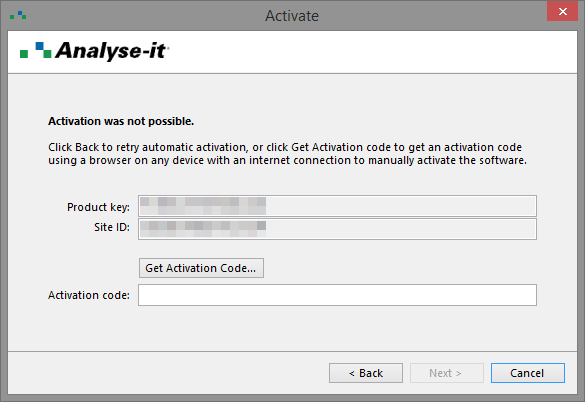 Your browser opens the manual activation page at http://analyse-it.com/activate. If your computer does not have an internet connection, you can open the page on any computer or device with an internet connection. On the manual activation page, enter the Product Key and Site ID from the Activate window. Note: The Site ID is unique to each computer. Do not contact technical support asking for a Site ID as we cannot provide it. It only shows on the Activate window in the software. Enter the Name, Organisation, and E-mail of the registered user of the software. The activation code shows in your browser window. In the Activate window, enter the Activation code from your browser window.